This article is a work in progress. Better photos, supporting documents, and complete information to come. 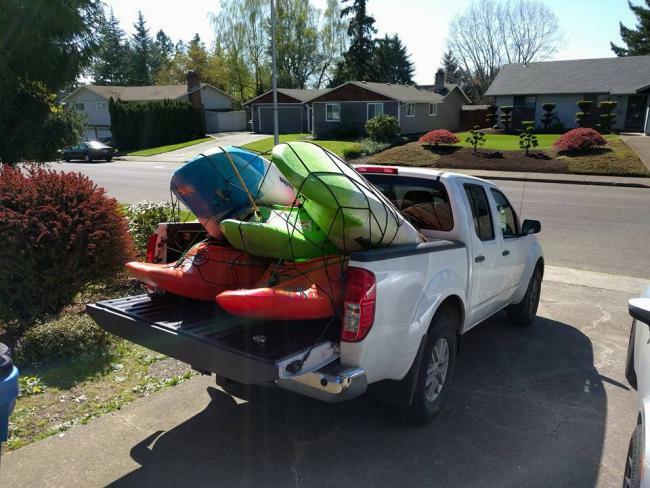 The nice thing about kayaks, is once you get a handful of them, if you're savy you can just keep juggling them around to get new ones. Sell two cheap ones, get one nice one. Sell one nice one, get two cheap ones... keep it moving around as you get to try all of the different boats you want. You lose some money, you gain some money, you fix some boats... you just keep juggling boats and get to try everything you want. With this mentality and said hanful of boats, I've been able to look high and low for good playboats. One playboat that stuck out the most to me in my pursuit of playboats (and later my girlfriends pursuit) was the Kingpin. The Dagger Kingpin is fairly coveted by those who have them. The people who have them love them and finding them for sale can be tough because of this. People are rarely moving past them. They're just such good boats to learn flatwater tricks in and are a hoot. They were wildly popular it would seem, as they were available for longer than any other Dagger playboat that I have seen, as witnessed in Dagger's own publications. New boats came and went, while the Kingpin remained, until finally Dagger paired down it's whitewater offerings, sticking with just the Jitsu instead of offering multiple playboats. Between myself and my girlfriend, we now own a Kingpin in every size manufactured. We own a 6.3, a 6.2, and even the little wimpy 6.1 (it's tiny). We've also had one model for each functional change. We have an early model where the bolt on flotation was available, we have one with the inflatable hip pads, and we have one with the last modern and normal outfitting they put on these boats. We've spent hundres of hours combined playing in these boats, and I'd say we're a fair judge of these boats across all sizes and model differences. This boat is solid for those looking for a cheap playboat to progress their skills. If you have the luxury of affording just a boat to play in the pool with, this is great for learning to cartwheel as well. Outside of that, modern playboat offersings from Jackson (2014+ rockstars, 2013+ allstars) vastly supercede this boat for getting vertical and especially for comfort and confidence inspiring feel. Modern Jacksons can be had for reasonable used prices ($500-700) while these boats run $250-350 or so used. The extra money is well spent in my opinion on a more modern playboat from Jackson. The only thing this boat wins at is getting the bow down for cartwheels. Accross the board, this boat does not compare anywhere else. This boat however compares quite favorably to the Wavesport Project X and equivelant models of playboats. The Jed does compare favorably enough if you happen to be just the right build for those boats. I don't recommend anything other than the Jackson's though for Modern playboats. Playboating has it's roots in squirt boating. Those silly, long, ultra low volume, slicey boats meant for going underwater of all things. As playboating, kayaking, and manufacturing itself progressed, so did the "playboats" of the time. They beame less long and slender, and start to become shorter with more volume concentrated around the user over time. This meant the easier to get vertical boats started to become a bit harder, but gained some other benefits. At the tail end of 2014 or so, most boats had become big, blocky and large volume. Larger playboats started to rival small to mid sized river runners and even smaller CREEKERS in volume. From what I can ascertain, the Kingpin represents a critical turning point in the industry. The kingpin has a foot on each side of the fence if you will. It's slicey, but not to an excess of length and thus is close to the current length of playboats. The kingpin's volume began to increase around the user, a departure from older boats. It's reall the middle point of progression, and the last of the slicey older playboats. For the user looking for an easy introduction to flatwater cartwheels without having to take on the notable limitations of the REALLY old school boats, the Kingpin bridges the gap nicely. I hit my first back to back cartwheels in this boat, and sometimes hit as many as 9 back to back. This transitions from end to end with relative ease and is good at staying vertical. The outfitting is rather lackluster. The later models had the best most straightforward outfitting in my opinion, with the backband locks giving a semblance of adjustement. The 6.1 that we have features adjustability behind the backband only, which is absurdly lame. We converted all of ours to "Da-ckson" outfitting by adding cleats and strings to the backband to emulate jackson outfitting. We also used some elastic cord to keep the backband up height wise, another Jackson outfitting style design. If you're getting this boat and really planning to use it, look into upgrading the outfitting as we have. You won't regret the upgrade! Comfort wise, these boats can be a bit tough. In order to stay relatively low volume and longer, your legs are fairly outstretched and the bow itself isn't very large. This means sizing wise if you're tall (or have a long inseam) by comparison to most people at your weight, you'll want to go for a larger size of kingpin just for comfort. The boat's aren't the fastest, but they never left me feeling like they were inadequate. They aren't the most responsive, but they aren't dull either and are more than agile enough for a playboat. They aren't the best surfers but aren't bad by any means, with the main complaint being pearling (bow sinking) is not entirely uncommon. They don't stern squirt nearly good as modern Jackson playboats, which is surprising given the long flat slicey tail. Paddling this boat back to back with a 2016 Rockstar really made me question the belief of the thin slicey tail as the ultimate squirting design... but I digress. This boat does reward efforts to get vertical with minimal resistance compared to some other boxier playboat designs. These boats are fine in a hole per multiple trips to the Bend WW park. The 6.3 is obviously the largest of the boats. For myself at 220, I am at the absolute upper end of the advertised weight range. With my seat all the way forward and not over loaded with gear I found the boat treated me great. At the bend whitewater park I hit my first cartwheels in a hole, back half wheels, and all sorts of other fun tricks in the bottom hole feature. I've loaned this boat to friends all the way down to 175lbs, and while they were able to paddle the boat fine, the ability to get it vertical diminishes notably, with stern squirts suffering the most. My Girlfriend at 150 hopped in here for giggles and couldn't get the boat to stern squirt for the life of her. The 6.2 is the medium size, and the play boat my girlfriend has been running rivers in At 155lbs, she gets the boat to squirt pretty vertical and rarely struggles with it. She's working towards her first cartwheels and is already getting pretty vertical on the bow, but often pirrouttes or falls over the bow as she's still dialing it all in. A heavier paddler would have an easier time getting it to cartwheel, but me at 5'10" with a pretty short inseam could barely jam myself into this boat, so be I'd say 5'8" is a good max height to consider to run this comfortably. The 6.1 is the small size, and it is very small. It's not very wide with a low deck height, but retains a good length and the slicey nose and tail. This means the boat gets vertical with exceptional ease, but Danielle at 155 is at the absolute max for it, if not above it. We picked it up so as she could use it in the pool and it treats her really well there. It would be impractical for her to try and run at her weight of 155 and height of 5'6".